Join Captain Jonathan Archer and the crew of Enterprise NX-1 to see where the entire epic saga of galactic exploration began. 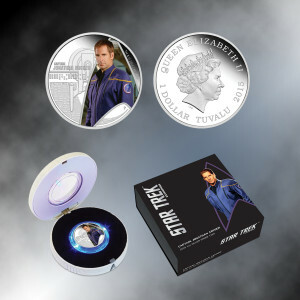 This colorized silver coin celebrates the galaxy-roving adventures of Star Trek: Enterprise. If this coin does wander into your collection during its interstellar travels, it'll be at home in the special display box, resembling a transponder, that lights up to showcase it. Lighted display box. Batteries Included. 5.75 x 5.75 x 2.75"